UPDATE: This watch is now sold out, so check out the rest of today’s top last-minute deals right here. EARLIER: If you’re on the lookout for a new smartwatch and you don’t want to spend hundreds of dollars on an Apple Watch or one of Samsung’s smartwatches, we’ve got exactly what you’ve been looking for. 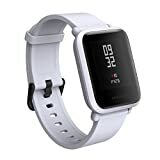 The Amazfit Bip by Huami costs just $79.99 on Amazon and it’s packed full of great features you won’t find on rival models that cost hundreds more. It has a great display and all the standard features you want, and it’s compatible with Android phones as well as iPhones. It also supports GPS, all-day heart rate tracking, and sleep tracking, and it lasts for about 30 days on a single charge! 【Notification Reminder】When your phone receives calls or messages, you will never miss it because the watch will remind you by vibrating on your wrist. Moreover, you will be instantly notified when your phone receives app notifications from Facebook, Wechat, WhatsApp, Instagram etc.